Skip Groff, center, gives Jim Spellman (right) and Archie Moore “the boot” after they left his employ to go full-time with their band Velocity Girl. Photograph courtesy Jim Spellman. A trip to Yesterday and Today Records was nothing short of a pilgrimage for a teenage suburban music fan like me in 1983. Two Ride On buses and a short hike up Rockville Pike got me from my family’s house in Kensington to a cramped storefront in a strip mall behind the Entenmann’s outlet, across from Heavenly Ham. In this unlikely location, amid the sprawl, sat an oasis filled with tens of thousands of records: LPs and a massive selection of 7” 45s—punk records, pop records, hit records, obscure records. At the center of the chaos, surrounded by these records he loved so much, was owner Skip Groff, who died Monday at age 70. He is survived by his wife Kelly and daughter Kirsty, named for British pop singer Kirsty MacColl. As my band Velocity Girl was getting started in the early 1990s I worked at the store on and off for a couple years. Skip had a profound impact on me as a musician, and I am glad to have been his friend. He was an Air Force brat who did stints as a DJ at Washington area radio stations, including WINX and WAVA, where he would occasionally interview pop stars like Rick Springfield. He opened Yesterday and Today, known as Y&T to the faithful, in 1977. The shop took its name from a Beatles album. A version of that record with legendary “butcher cover” is among the most collectable records in collector’s circles. The shop served an array of record collectors and music lovers. There was April Wine guy, the Aldo Nova dude, plenty of Springsteen completists and Damned collectors. People came in to stock their rec-room juke boxes, buy import alternative records, or sell their first pressings of British invasion hits. Y&T soon became a hub for local musicians, a place where you could work between tours while taking a master’s course in pop-music history. Skip didn’t expect much of us, but he loved being around people who made music. We loved being influenced by all the amazing records we listened to in the shop and took home to play for our friends and bandmates. At Y&T, it was common to be waited on by the person whose picture was on the record you are buying. That could be intimidating, but it cemented in my mind the idea that this is a community we are all part of. On any given day your clerk might be Ian MacKaye, the Minor Threat frontman and Dischord Records honcho, or Ted Niceley, Tommy Keene’s bass player. Skip ran the shop, released records on his on his Limp label and produced local bands including the Slickee Boys, Minor Threat, and the Velvet Monkeys. These bands had little connection to the Beatles or Rick Springfield, but Skip never seemed to sell any of the bands short. To Skip it was all part of a continuum—songs, records, people, music. Skip was an improbable figure to be at the center of a burgeoning punk/new wave/indie rock scene around Washington. He was a generation older than most of the scenesters. He was heavyset, often unkempt, enjoyed off-color jokes, lived in Olney, and was an early minivan enthusiast. In later years he loved country music. He could be mercurial, as all good record shop owners can be. He once “fired” me for allegedly breaking open a pen and splattering some records with ink. The next morning he called to scream at me for not being there to open the shop while he watched the Redskins game. Then he would turn around and be very sweet—pulling aside records he thought I would be interested in, or asking me to autograph a Velocity Girl poster. Y&T’s brick-and-mortar incarnation closed in 2002, and Skip shifted to online sales and regional record conventions. 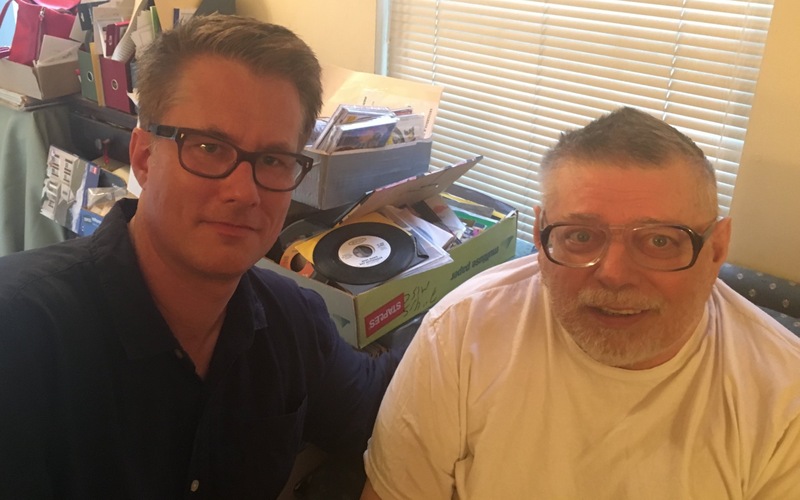 We kept in touch on Facebook but I didn’t see him much until last summer when my stepfather unearthed his record collection, a few thousand LPs and 7” singles. There was plenty of classic rock and a handful of rarities. After a little wheeling and dealing, Skip agreed to buy the collection. I delivered the records to his house and we spent an hour or so catching up. He had trouble getting around, but Kelly was there to help him, and he told me all about Kirsty. He loved them both very much—a side many of Skip customers didn’t get a chance to see. Who knows this stuff? Skip knows. We talked about the Beatles and the Stones and Link Wray and Ricky Nelson and Travis Tritt and Youth Brigade and Glen Campbell and Gang of Four and Nancy Sinatra and Teen Idles—the easy conversation that two old friends have over a mutual love. It was a good day. I am glad that the last saw him he was doing what he loved: talking music, surrounded by boxes full of records. Spellman and Groff last year. Photograph courtesy Jim Spellman. Jim Spellman is a DC-based journalist and musician. The debut album by his band Foxhall Stacks will be released this spring. He can be found on Twitter: @jimspellmanTV.